Stock photo of winding railway tracks beside the snow and ice fringed Bow River during winter, Banff National Park, Canadian Rocky Mountains, Alberta, Canada. 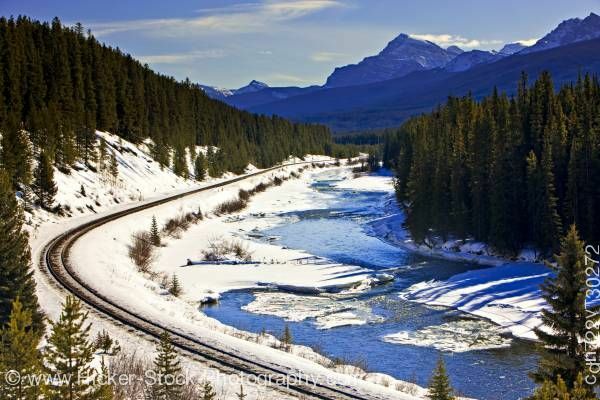 This stock photo includes winding railway tracks beside the snow and ice fringed Bow River during winter, Banff National Park, Canadian Rocky Mountains, Alberta, Canada. Banff National Park forms part of the Canadian Rocky Mountain Parks UNESCO World Heritage Site. The Bow River is a tributary of the South Saskatchewan River, and is considered the head water of the Nelson River. The name "Bow" refers to the reeds that grew along its banks and which were used by the local First Nations peoples to make bows; the Peigan name for the river is "Makhabn", meaning "river where bow weeds grow".